If your vision isn't perfect, whether you cannot sell well close up or if you cannot see well from far away, you will need a prescription to correct your vision. This prescription can come in the form of glasses or contact lenses. If you are thinking about getting contracts, you will need a special exam. What Is the Difference Between An Eye Exam and a Contact Lens Exam? During an eye exam, your optometrist will test your visual acuity to determine whether or not you will need glasses. If you do, they will perform a refraction to determine your prescription. Your optometrist would also test your eye pressure and test for diseases of the eye. A contact lens exam is different. Because the contacts would fit directly on your eye, the optometrist would need to take measurements to determine the size contacts that you need. During the exam, your optometrist would also make sure that your eyes are healthy enough to wear contact lenses. What Are the Pros of Contact Lenses? There are a few benefits of wearing contact lenses. The main benefit is for appearance sake. When you are wearing contacts, you won't need to wear glasses. This can significantly change your appearance. If you want a drastic change in your appearance, you can wear colored contacts which will change the color of your eyes. If you are an athlete, contact lenses can be very helpful. Wearing glasses while playing sports can be both dangerous and distracting. During your contact lens fitting, your optometrist will take measurements to determine the best contacts to fit your eyes. 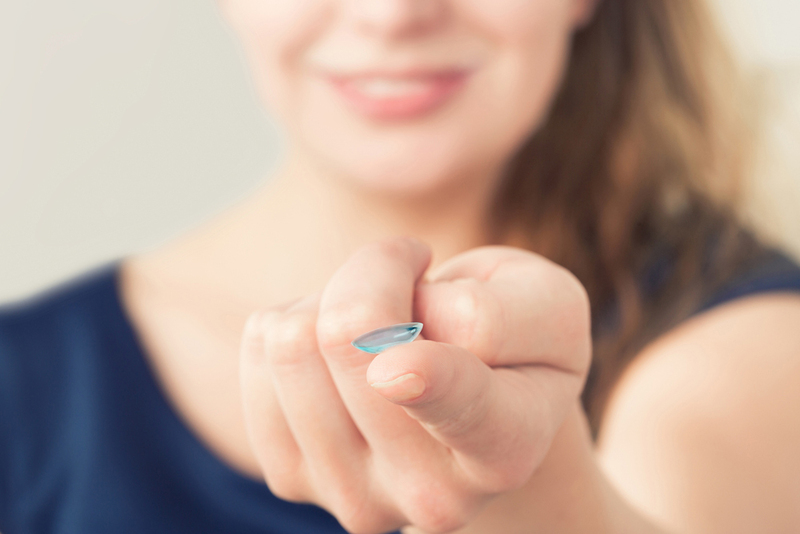 Most optometrists keep trial contact lenses on hand. If the optometrist has your prescription in stock, they may put them in your eyes to see how they feel and to test your vision. After the fitting, you will be taught to insert your lenses, remove them, and how to care for them. After the fitting, you would wear your trial contacts for a week or two to see how your eyes adjust to them. If everything is fine after your follow-up appointment, you would order your supply of contact lenses. If there are any issues, your optometrist will make the necessary adjustments. There are many types of contact lenses available today. The most common types are disposable lenses. These are lenses that would be thrown away after a period of time. Daily lenses are great for someone whose eyes produce an excessive amount of protein. They are also great for anyone who doesn't have the time to properly clean their lenses. Weekly lenses, bi-weekly lenses, and monthly lenses are also available. If you have astigmatism, you can still wear contacts. Toric lenses are designed to treat astigmatism. If you have hard to fit eyes, gas permeable or scleral contacts are an option. Looking For Contact Lens? Contact Us Today! If you are thinking about getting contacts, you should make an appointment with Arvada Optometric Center in Westminster. Not only will an optometrist check your vision, but they can also do a complete contact lens exam.